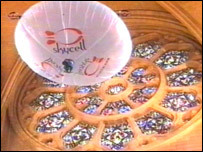 A helium filled mini-airship has been used in Truro Cathedral to help gauge repair work needed to a window. A digital camera has been secured underneath the craft to collect images of the South Transept Rose stained-glass window and surrounding stonework. It was hired because a cherry picker would have cost six times as much and required the floor to be strengthened. It follows some of the masonry at the window falling down four years ago. The area was closed off afterwards. The novel airship was hired at a cost of £2,000 to check the stonework 60ft (18.2m) up to see if any repairs were needed. A cherry picker would have cost £12,500. Richard Glover of the Cathedral said: "The great thing is that we can spend half a day getting very detailed pictures of the state of the window, which means that we'll have a much clearer picture of what work does need to be done. "But it was also flown up for more fun pictures for our website, postcards and that sort of thing from places that are completely inaccessible."